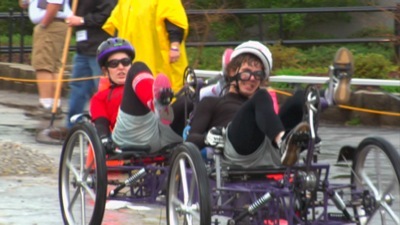 The 15th Annual Great Moonbuggy Race Rocks!!! 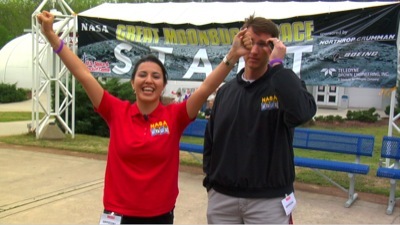 The 15th Annual Great Moonbuggy Race held at the US Space and Rocket Center/NASA Marshall Space Flight Center in Huntsville, AL was amazing. Hats off to all the winners, competitors, organizers, volunteers and everyone who helped contribute to this awesome event. Both the high school kids and the college kids showed tenacious ingenuity in their battle against the elements and circumstance. For example, on a couple of starts chains were popping off within a few feet. Some were able to get their buggies up and running quickly, others were off to the pits to make corrections for a second run. All of which took place under cruel rainy conditions. 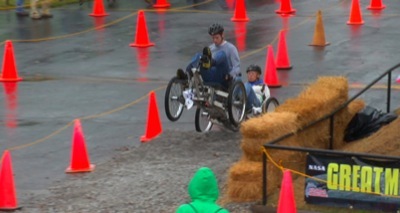 And the obstacles took their toll as well. We named several obstacles (the NASA EDGE – giving you an inside and outside look at your buggy if you hit the obstacle poorly, Keyke’s Corner, the infamous Shackelton Crater, and the San Antonio Sand Trap.) 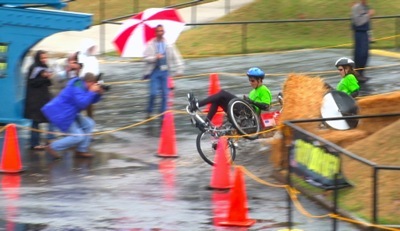 The NASA EDGE obstacle was particularly fun because of the look on the faces of the drivers as they hit it. They seemed to know it was going to be wild, but they were compelled to tackle it with full force. No obstacle, however, was easy. I’m actually cramping up just thinking about it. Must change subject…. One other really cool thing about the race was seeing the volunteers who happen to be engineers just chomping at the bit to get in there and help modify designs and share ideas. They didn’t, but they had that gleam of inspiration in their eyes. My suggestion is to have a Hall of Fame Day added to the competition that would allow retired engineers try their hand at this challenging event. Until we post our NE@ Vodcast of the race, please enjoy the following pics. They certainly don’t tell the entire story, but they do give you an idea of some of the intense action. Important Note: Unfortunately, due to internal regulations, we cannot accept posts that include any links to another website. Looks like yall had fun! :)… Do you know if any will go down in Houston? This looks like fun! Yes, it does look like fun, and hard work! 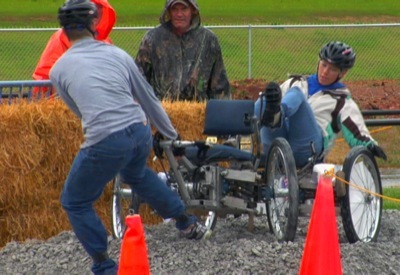 I was so excited when I heard that the Great Moonbuggy Race would be happening soon! The pictures look great. I am sure everyone had fun. I am working for nasa.My education in Animation corse.Higer Diploma in 3d Animation(HDA).Design Contest inform me E:mail.